The Nikon MH-24 Quick Charger rapidly recharges an EN-EL14 or EN-EL14a li-ion battery. Box Dimensions (LxWxH) 4.7 x 3.7 x 3.6"
MH-24 Quick Charger is rated 4.7 out of 5 by 74. Rated 5 out of 5 by Jeffrey from Nikon MH-24 Charger Works Great Well, I left my original Nikon MH-24 charger in some hotel room - bummer. I then purchased from an online auction seller a supposedly original Nikon MH-24 charger for cheap - bummer. It took forever to charge known good Nikon batteries to an almost full charge, and it would never ever lite the END charge light. Okay, you do get what you pay for when you buy the genuine product. Purchased the real Genuine Nikon MH-24 charger from B&H. As always, B&H service is efficient and prompt, and I received the real deal. Of course it works as it should. Batteries charge FAST, and the lights work as they should. I learned my lesson - buy the genuine Nikon product. Rated 5 out of 5 by Careynee from Great Charger! I love that this charger does not have a cord to keep up with and just plugs right into the outlet. Works great! Rated 4 out of 5 by T J from Very handy charger for travel This is in fact a very handy charger, period. I like it for travel because the built-in, flip-out 120V plug obviates the need for carrying a separate cord. For non-travel times, though, a cord can be handy, and this didnt come with that option. Granted, I could use a standard extension cord ... but I cant ever remember where I last put it. Functionally the charger is ideal - charges quickly and the LEDs ensure that the user easily knows the state of charging. Id recommend it, or buy it again. Rated 5 out of 5 by Anonymous from ONLY PURCHASE THE NIKKON CHARGER FOR THE D3100 CAMERA I'm happy with the charger - first of all because it is from Nikkon - same as I had before I lost mine. I know I'm not doing damage to the battery. I had purchased one from Best Buy, it was not Nikkon and it was so clumsy and it did not fit into my camera bag for travel, I returned it. I could not find a Nikkon so I called them - they no longer made my camera D3100 and hence did not have the accessories any longer. However, they emailed me a list of stores that did and I'm thankful. I recommend buying the Nikkon charger - it is more expensive then others that may work or not, however piece of mind and size I would not go any other way. P.S. I found my original charger after receiving my new one and decided to keep both just in case I do lose it down the line and being they are hard to find. Actually thinking I should purchase a new battery while I can. Rated 5 out of 5 by Anonymous from Sticking with OEMs There are so many electronic device knock-offs available on the web, it's almost impossible to buy an OEM item even when trying to do so. Granted, the knock-offs sometimes suffice, but they are never as reliable as the original. After tossing out the malfunctioning knock-off MH-24 Quick Charger I purchased on eBay, I went straight to B&H for correcting my earlier lack of judgment. Now I have reliability and peace of mind. Is this compatible with the d3300 battery? Yes, this is compatible with the D3300 battery. Am I able to charge this with a USB cord? This unit plugs into a socket. I've never tried to charge it in any other way. Time to full charge a battery? I have never timed it. When my battery is low I put it in the charger at night and it is ready in the morning. IS THIS ITEM FOR 110 VOLT ONLY? IF ONLY FOR 110V, IS THERE AN ADAPTER AVAILABLE FOR CHARGING THE EN-EL14 BATTERY FROM THE CIGARETTE LIGHTER RECEPTICLE IN A CAR? ALSO IS THERE A CASE AVAILABLE TO PROTECT THE EN-EL14 BATTERY WHILE CARRIED SEPARATELY IN A CAMERA BAG? THANK YOU FOR THE PHOTO CATALOG. 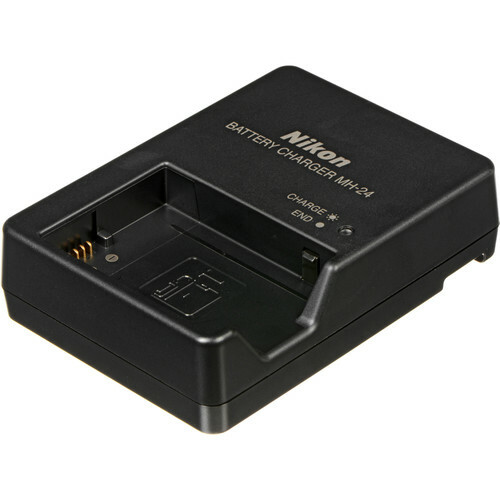 Will this charger work for my nikon d5300 battery? Yes it will. I use that very one for my D5300 battery. Answered by: James P S.
Will this charger work with D3200 battery? Works perfectly. The first one that I had exploded in India but this one still does the task! how do lights reflect charge status/end charge. ie, red = charging/green = charge complete? How many years does the charger last?